Oralject Goat and Sheep Wormer from Virbac Animal Health is a broad spectrum anthelmintic paste for worming small numbers of goats and sheep. Oralject Goat and Sheep Wormer contains morantel citrate, a broad spectrum wormer that controls gastrointestinal worms. It can be used to treat young, stud and pregnant animals. 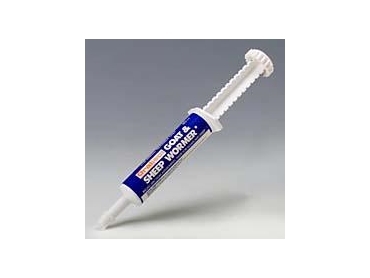 Oralject Goat and Sheep Wormer is a simple, economical solution to worming goats and sheep. Each dose can be administered in a dial-a-dose applicator, eliminating the need for costly drench equipment. Each tube of Oralject Goat and Sheep Wormer treats up to six lambs, two average sized sheep/goats, or one large sheep.